Thought I'd start a post on the WIP for my Blood Angels. Bit of a background first...started in this hobby 2 years ago and have been strictly a hobbyist. Don't know much about the actual game play as I have never tried a game though I do enjoy the fluff. Since getting into the hobby, I've been mostly buying HQ/Elite models as they seemed "cooler" to paint than the normal rank and file troops. Recently, I bought an army from Craigslist and have since started off creating my first army: Blood Angels! All the used models have been soaked in SimpleGreen and stripped of paint already. 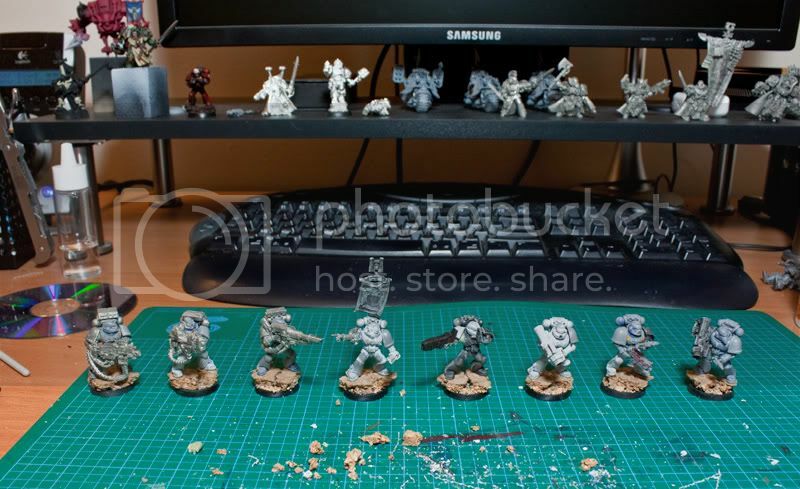 I've started work on the 25 units that will be the 2 tactical squads/1 combat squad. Here's a picture of the 5 guys I've painted so far. 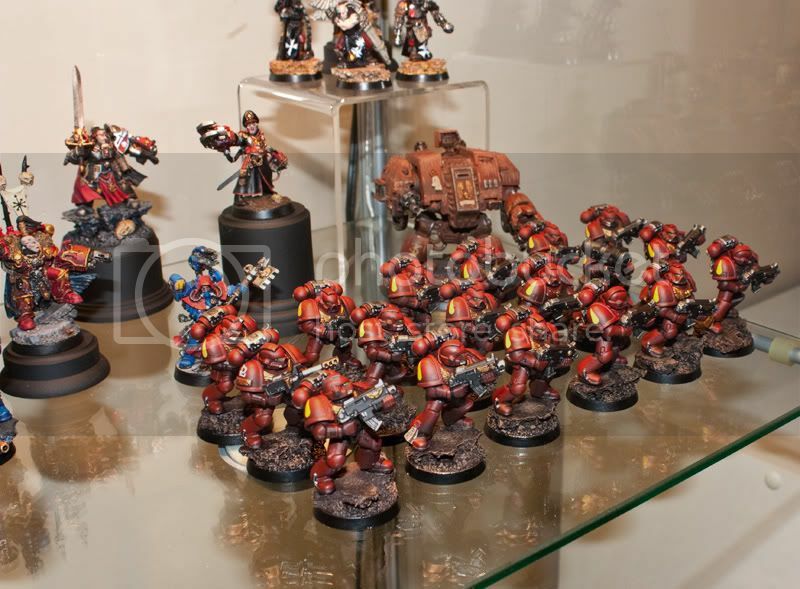 Very nice, I'd digging the darker blood angel look. Thanks wizard12, I never personally like the bright cartoonish look of the normal BA scheme so I tried to go for something a bit darker with deeper shadows and darker reds. Ok. Got some pics of some of the rest of the tac squad finished and in my display case. They have a satin finish which really shines from the camera flash but they are much more matte in appearance in person. Also finished stripping paint from a few more models, got them rebuilt and rebased. Another hand in front of face plasma gunner? Elites: Sanguinary Guard are very good, however they are also very expensive and dont have an invul save. Sanguinary Priests are a must. They give furious charge and feel no pain to anything within 6 inches, and you can take 3 as 1 elite choice. Corbulo is nice and hard to kill, but a bit overpriced. Furioso Dreadnaughts are basically venerable dreadnaughts without the 'venerable' rule, but they are still good. i recomend frag cannon and heavy flamer. Mag-grapples are nice but not a must. Furioso Librarian is also nice, but again not fantastic. Troops: Death Company are expensive but good. 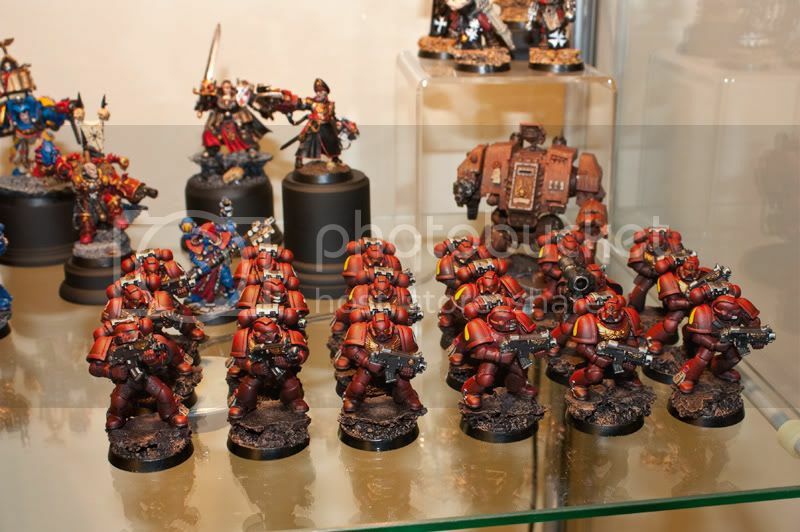 I recomend take 9 of them, with 3-4 power weapons and a hammer, with a chaplain(now elites not HQs) in a rhino. Don't take jump packs because they are overpriced, unless you're gonna take lemartes with them, and even then only take 5 of them. 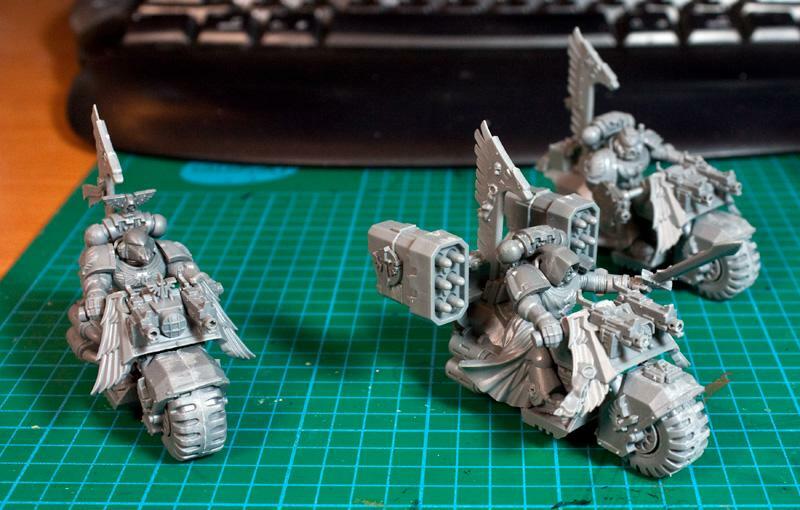 Dedicated transports: Blood angels can now take all 3 land raiders as transports, however being land raiders they are still really expensive and not really recommended unless you put assault terminators in them. O and land raiders can deep strike now too. Fast Attack: Baal Preds now have scout and fast. Arm them with inferno cannon and heavy flamers and watch your opponant cry. Remember that all your infantry and dreadnaughts have red thirst, meaning that you're gonna get a fair few furious charge and fearless marines. So even your tactial squads with red thirst are gonna outfight vanila marines on the charge. battle Brother Lucifer wrote: Another hand in front of face plasma gunner? Yup, everyone with a SM army needs a plasma gun shy model! Thanks! I haven't bothered creating an army list yet since I don't know if I'll be playing the game but if I do, I'll keep your advice in mind. Really strong paint jobs there. Are you going to trim the shoulder pads? I think it'll help break up all the red. Looks just a little too much right now. You've got skills there though mate. Very interesting style take on BA, nicely done! jackanory wrote: Really strong paint jobs there. Are you going to trim the shoulder pads? I think it'll help break up all the red. Looks just a little too much right now. Yup, originally I was going to do the shoulder trim in black to give more definition but all the reference pictures I found on BA Tacticals had all red shoulder pads except the Sergeants who have a black middle. I tried doing more shading on the bottom half of the pads to give more contrast between the middle and edges but I don't know if that shows up as well. I like your bases, just plain cork or? Will you add some death company troops later? These look great! love the muted colours, did you airbrush or normal brush? the conformity says airbrush, but the models say awesome! Limbo wrote: I like your bases, just plain cork or? Will you add some death company troops later? Thanks. Bases are done with torn up cork boards. Then sprinkled with GW basing sand for the cracks in between. nerdfest09 wrote: These look great! love the muted colours, did you airbrush or normal brush? the conformity says airbrush, but the models say awesome! Good eye. 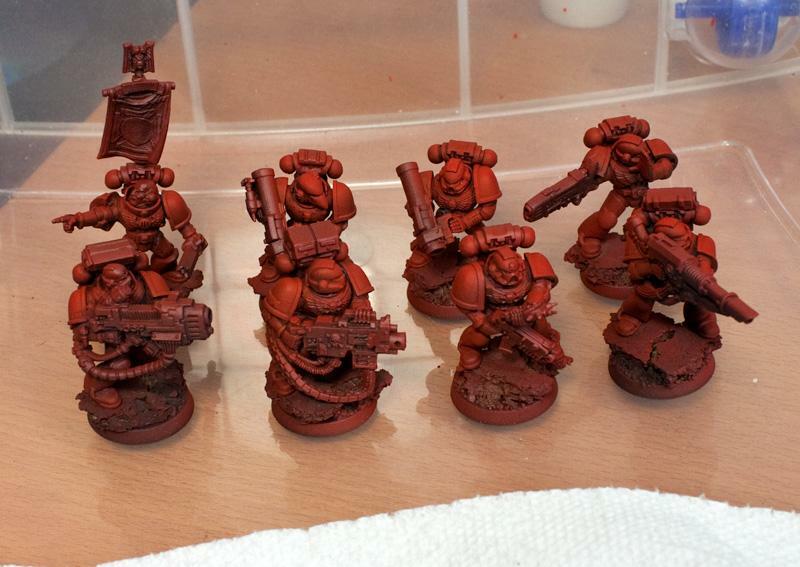 They are airbrushed for the basecoat, shadows and highlights. I then go back and line in the details and paint the metallics. Saves me a ton of time. 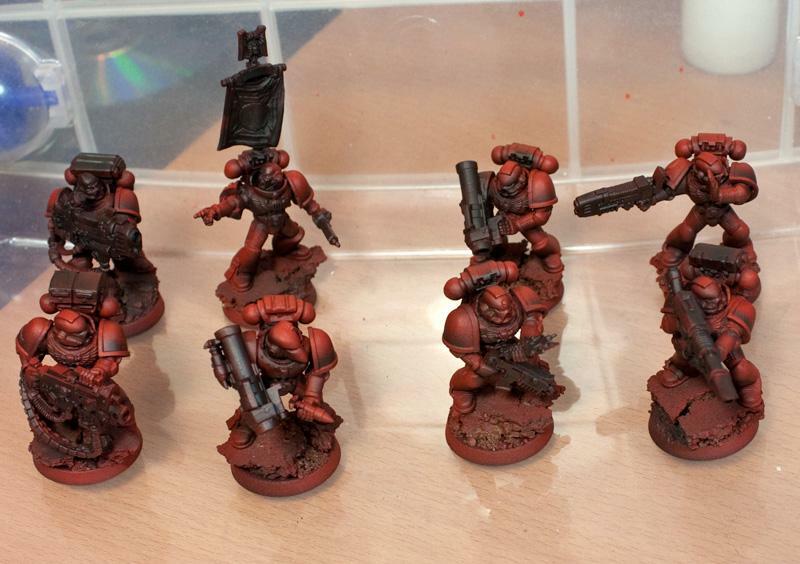 Also I do my basecoat/primer using Duplicolor Rust Primer which gives it a darker red base. 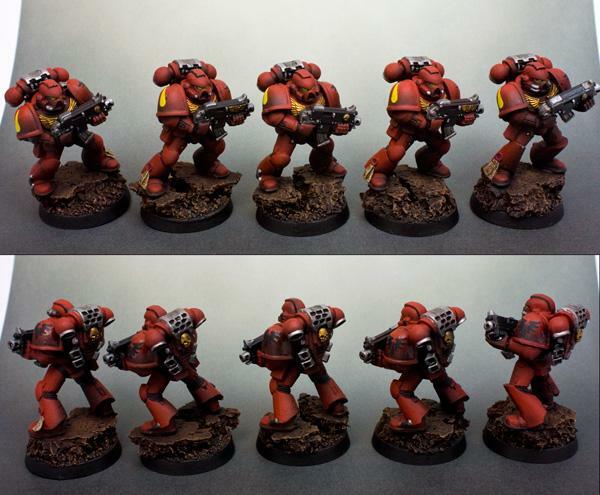 I like the looks of these Blood angels, they look a little bit like Angels Vermillion mixed with traditional Blood Angels. well your method works fantastically, I've not toyed with airbrushes yet but would love to as i'm all about chasing a good loking army that is quick to paint, and i've always loved the look of airbrushed marines, it suits the shapes of the armour much better than brush blending, and your models are testamount to how good it looks! @Redbristles In the mean time why not try out army painters range. It may help you cut your paint time, I know it did for me. Especially on vehicles. I like the gradient shift from lights to darks on the Tac squad. It gives it more depth and makes it stand out. Ah, it was a box of Ravenwing Bike Squadron I picked up for free. The upgrade sprue it came with had the typhoon missiles in it and I just figured I'd throw it on the main bike for fun. Don't plan on running a DA army so doesn't need to be game legal. 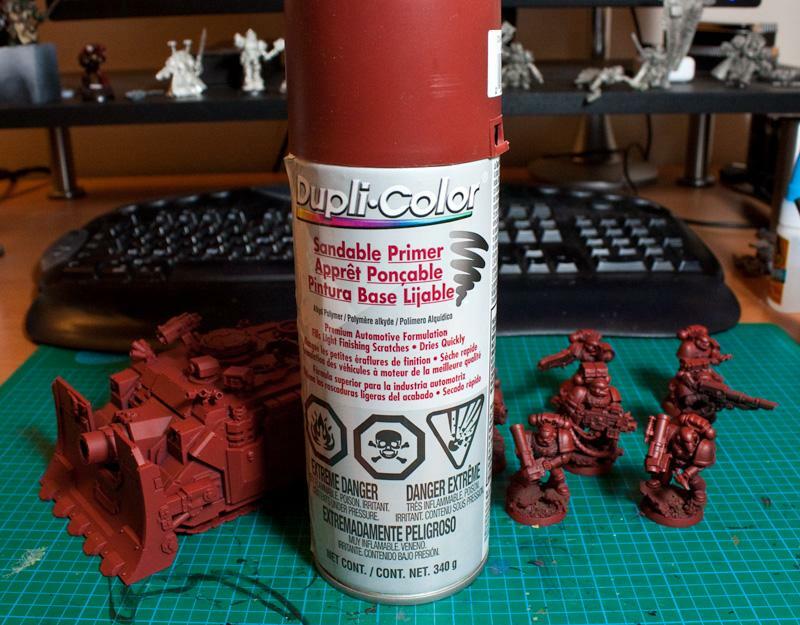 For my BA army, I've been using Duplicolor Sandable Primer Rust which I picked up at Canadian Tire which is a hardware store in Canada. 10 bucks a can so compared to GW, it's relatively cheap and provides good coverage w/o obscuring detail. I also use their black primer as well and I think it's the best compromise between quality and price. If you can find it, definitely try it out as it will make base coating your BA a lot easier. Got the other 8 units primed and airbrushed tonight. Primed using duplicolor primer rust colour. 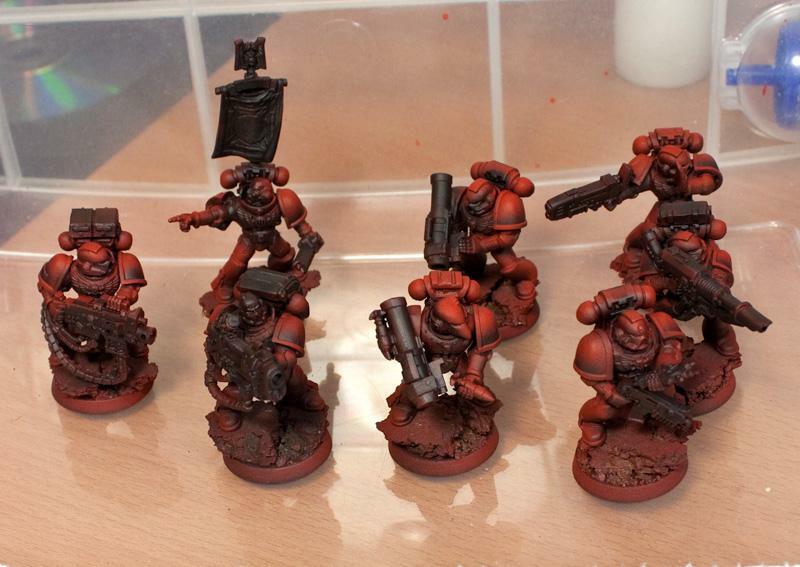 Here's the first airbrush step where I've added highlights using Blood Red airbrushed on top of the primer. Second step I've added shadows using a mixture of Createx Airbrush Colors paint: Opaque Red and Opaque Black in a 50/50 mix. I also added blue masking tape which is specially designed for painting on the bottom of the shoulder edges so I can add the darker transition between the shoulder pads and outer rim. Final step I've used a watered down Opaque Red on all of the surfaces to kick back the Blood Red. I personally don't like the orange-ish red hue of Blood Red so this is basically a filter that gives it a richer red colour while removing the orange hues. In a Toyota, plotting revenge. Excellent dude! My favourite blood angels army by far! metallifan said: I almost wonder is "Matt Ward" another pen name for C.S. Goto? Play KoL! Click my sig to go to the main website and sign up! Wow, those are awesome. I've started work on a BA army myself and they kind of put mine to shame a little, so dark and moody. That's great work, can't wait to see the rest of the army and characters . Titans: For those commanders who do not believe in overkill. Your painting is excellent and a nice break from the blaringly bright red we normally see. 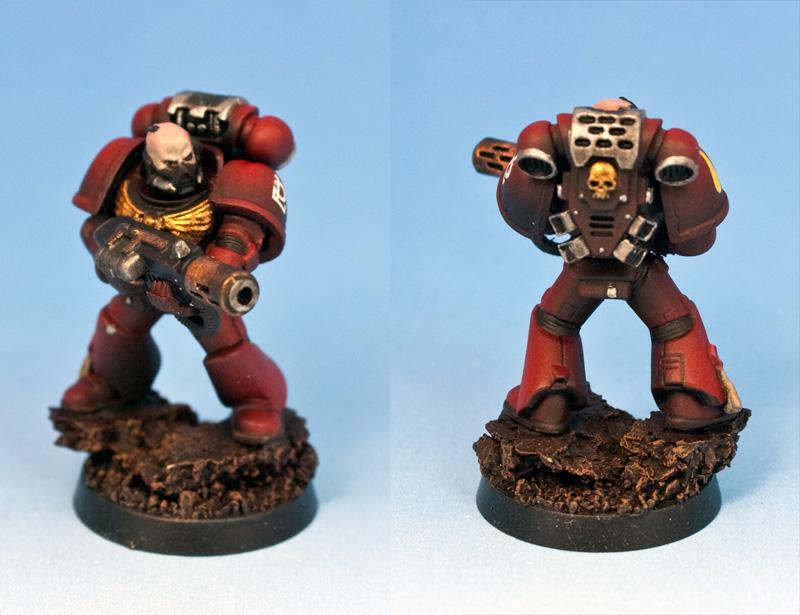 My one problem is the blood drop icons on the shoulder pads, it just somehow seems like a very stark contrast, maybe weather them a bit or use a darker yellow? Boss 'eadbreaka wrote: Your painting is excellent and a nice break from the blaringly bright red we normally see. Just a quick post of a melta gun marine. Singled him out since he didn't have a helmet and had to do his skin. Also, a side project is my DA Terminator Captain. Used some parts from the DA Vet Upgrade Sprue including the autogun. Just need to finish up a display base for him which is delayed by my order from Bitz Barn. I'd have to say they are the worst Bitz company I've ever ordered from as it's been a month since my order. Anyway, that rant is for another time. No worries. Part of the reason I started this painting log is to get feedback which keeps me motivated! Thanks. Looking back at the decals now, you're right, they do stand out a bit too much. I'll have to revisit them later and see if I can tone it down a bit. Shading them lightly along the bottoms shouldn't be too much work with the airbrush. 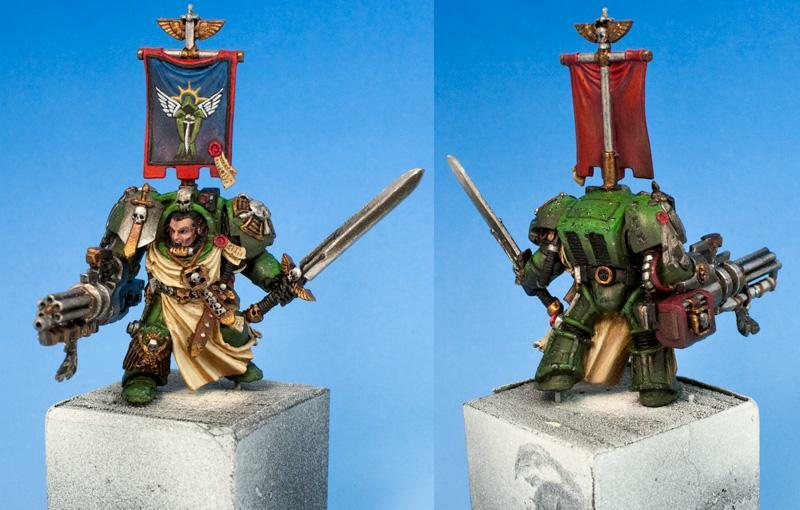 I like the pose on the DA, but the green is alittle to bright IMO, makes me think more of the Mantis Warriors. Thanks for the airbrush tutorial. Wow. What an effective way to paint with an airbrush. Other than a base color, I didn't think there was much reason to use an airbrush. Have I really been playing 40K for nearly 30 years?